Last weekend I made another recipe from the Two Dudes, One Pan cookbook, a big pot of bolognese. I was going to post it but something about it made me feel a little indifferent, despite the fact that three different people who devoured a bowl of it ladled over a tangle of linguine enthused that it was outstanding. I need to think about it, maybe make it again. Anyway, the recipe called for one stalk of celery. I sort of hate when a recipe calls for a miniscule amount of something that you can only buy in bulk. Am I right? Who's with me? Let's see some hands. Standing in the produce section at Bristol Farms I surveyed the heads of celery. I so didn't want to buy a whole head. I wondered if it was possible to break off one stalk and have them ring it up separately OR if they were so kind, they'd just give it to me for free. I didn't even end up asking. One head of celery only cost a dollar something so I ended up just going for it. I figured I figure out what to do with the rest later. But what? What to do with so much celery? Smear it with peanut butter and enjoy it as a healthy snack? I think not. The idea of soup came up early on, but it seemed sort of dull. I mean celery, although hardworking in the kitchen, is kind of a dull vegetable and to turn it into soup? It had the potential to be a big, steaming bowl of DULL. But I decided to just go ahead and make it into soup. I mean what else would I do with so much celery before it turns flaccid and I have to toss it in the garbage. I looked online for some inspiration and ended up combining three different recipes - one from Martha Stewart, one from Mary Sue Milliken and Susan Feniger that I found on the Food Network website (although theirs calls for celery ROOT, which I'm sure would be fantastic). 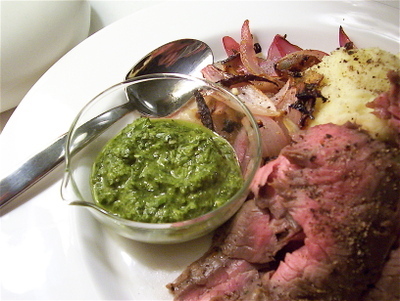 The salsa verde recipe comes from the Zuni Cafe cookbook. I've been wanting to make it forever but was unsure what to serve it with. It turned out that this soup was the perfect marriage. It also turned out this soup was far from dull. Despite the fact that I had had no intention of posting this recipe and as such took no process photos, I felt I had to put it on the site. Not that you need instructional photos for this. Trust me, it's pretty much just chopping and stirring. Melt the butter in a large dutch oven over medium heat. Add the shallots, celery, and potato, stirring to coat the vegetables with the melted butter. Partially cover and cook for 20 minutes, stirring occasionally. Add the garlic, celery seed, and cayenne pepper and cook for 1 minute. Add the vermouth, stir to combine and cook until most of the liquid has evaporated off. Add the stock, cover the pot and turn the heat up to high, to bring to a boil. Reduce the heat to low and simmer for 20 minutes until the vegetables are very tender, stirring occasionally. Puree the soup in batches in a blender until very smooth. Pour through a fine sieve, pressing with the back of a ladle to extract as much of the liquid as possible. Return the soup to the pot, stir and taste, adjusting the seasonings if need be. It'll probably need salt. Let the soup stay hot over low heat while you make the croutons and salsa verde. Just before serving the soup, add the cream. To make the croutons, preheat the oven to 400 degrees F. Tear the baguette into bite-size rough pieces and place on a rimmed baking sheet. Drizzle with the olive oil, toss to coat and the place in the oven to bake until golden and crisp, about 8 minutes. You might want to give them a stir about halfway through. To make the salsa verde combine all the ingredients in a medium bowl. Taste and adjust seasoning, adding more salt, pepper, or lemon juice if desired. Set aside so the flavors can mingle. To serve, ladle into shallow bowls. Scatter in a few croutons and spoon over some of the salsa verde. Grind over some black pepper and serve. I was pleasantly surprised by this soup. I guess I had low expectations. I mean, the only cream of celery soup I'd been familiar with was Campbell's and more often than not, it was an ingredient in a casserole. Well this is nothing like that. The celery has a bright, clean, fresh flavor that is juxtaposed by the creamy richness of the soup. It's all about balance and complimentary flavors and textures. The velvety texture of the soup, let's be honest, can be a little plain on its own. But the addition of the lightly crispy, ragged croutons and the salsa verde takes it to another level. The salsa verde adds another layer of delicate celery flavor and texture, while the capers infuse it with a briny tang. The soup is hearty enough for a meal, although I always tend to think of pureed soups as started courses, which is what I'm planning to do for the very first Thanksgiving dinner I'm hosting in the new house. Excitement! It would be a great precursor to poultry - a nice roast chicken or game hens (in keeping with the elegant feel). Wine and a big salad would perfect round out the meal. "What are you doing for dinner tomorrow night?" I asked Annie over the phone. "Nothing," she answered. "Why?" I explained that I had just been making a marinade for some some skirt steak I was planning on grilling for dinner for Mark and myself, but when I checked to recipe to see how long it needed to marinate, was mortified to discover that it needed 12 to 24 hours. She burst into gales of laughter. "So what are you going to do for dinner tonight?" she asked. "Go out," I replied. She asked why I couldn't just make it the next night. "Mark already has dinner plans with a friend of his," I told her. "Well then," she said, "I guess you're grilling me some skirt steak for dinner tomorrow." What made my mistake particularly shameful is that I wound up doing what my dear friend, my cooking partner is notorious for. You see, Annie has a habit of not reading recipes completely though before she starts making them. I call this "pulling an Annie." She will very methodically measure out ingredients and yet she almost never reads the recipe all the way through unless I remind her. As such we'll be cooking and all of a sudden she yelps things like, "Oh (expletive) I wasn't supposed to add the lemon juice yet!" or "(expletive)! The custard has to chill for several hours before we put it in the ice cream maker!" I just shake my head and sigh in an exasperated and condescending way. I on the other hand always read the recipe through, several times. So why did I miss such an important instruction, you ask? Well in my defense, this was a recipe that Annie and I saw demonstrated at a cooking class we recently attended at Border Grill in Santa Monica and during the demonstration, Mary Sue and Susan, the two women who own the restaurant, made this particular marinade and then a few moments later, were grilling the meat. I guess I forgot the part when someone from the kitchen ran out a piece of skirt steak that had been marinating since the day before. You can understand, right? And now, the tables have turned. And Annie is not the kind of person to take the higher road. Anyway, the next afternoon, I packed up my skirt steak along with the ingredients for the sides I had been planning on serving with it and headed down to Annie and Pierson's house in Culver City. Annie answered the door and just shook her head and sighed, a self-satisfied smirk on her face. I was not proud. Lightly toast the cumin seeds in a dry medium skillet over moderate heat until the aroma is released, stirring occasionally, about 5 minutes. 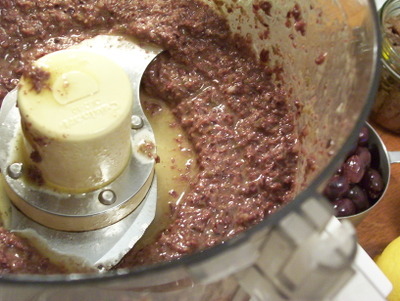 Transfer the seeds to a blender or food processor. Add the jalapenos, garlic, salt, pepper, and lime juice. Puree until everything is finely chopped and the seeds are ground. Add the cilantro and pulse some more until finely chopped and mixed well. With the processor running, slowly drizzle the olive oil through the feed tube until the mixture becomes thick and creamy. Taste the marinade and if you desire a little more heat, add some of the reserved jalapeno seeds and then pulse again until combined. I used about half of the reserved seeds. 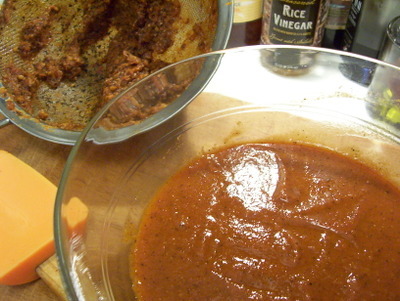 Set aside half the marinade in a separate bowl to use later as a sauce. Using your hands slather the skirt steak generously with the marinade then roll each piece into a cylinder. Arrange the steak rolls in a shallow casserole dish spooning over any remaining marinade. 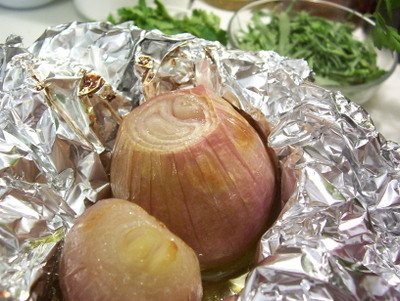 Cover with cling film and refrigerate for 12 to 24 hours. About 30 minutes before cooking, remove meat from refrigerator. Heat a barbeque, grill pan or broiler to very hot. One thing I didn't do but would recommend, is fold a paper towel into a small thick square. Blot the paper towel with some olive oil and then quickly rub the grates of the grill. This will help prevent the meat from sticking. Cook the steaks until just seared on both sides, about 3 to 4 minutes per side for medium rare. Transfer the steaks to a plate and let rest for 10 minutes. Slice the skirt steak against the grain (very important to slice against the grain, otherwise the steak will taste tough) into thin slices and serve immediately with a small dish of the reserved marinade to spoon over. This whole meal was incredible, not to oversell. I'm just being honest. The marinade is slightly spicy with a smoky subtext. My food processor didn't completely pulverize the cumin seeds and as such the marinade had an interesting texture. If you prefer, maybe grind the toasted cumin seeds in a spice grinder before combining them with the rest of the marinade ingredients. The lime juice and cilantro imbue freshness, and even if you think you don't like cilantro, do give this a try. The cilantro flavor is not at the foreground, rather it combines with everything else and the results are a bit more complex and interesting. I sort of wonder what it might be like with some mint added as well. I served the skirt steak with some sliced avocado, a mound of black beans that had been cooked with bacon, garlic and some earthy ancho chile powder, and some grilled corn on the cob, Mexican style, which is to say, slathered with a mixture of mayonnaise, lime juice, and cayenne pepper, then showered with cotija cheese. To drink, Annie made round after round of Blackberry-Thyme Margaritas. This marinade is fantastic on the skirt steak although I used the leftover to marinate a couple pork loins with favorable results. I would expect it working well with chicken too. But do take the time to let whatever it is you choose to marinate really soak in the flavors. It does make a difference. For a brief time in my early 20's, I dropped out of college and moved to Salt Lake City. I quickly met a boy and soon (waaaaay too soon) we got an apartment together. A short walk from downtown, it was one of those vintage buildings, built in the 20's, still full of original details and charm. The bathroom had little hexagonal tiles on the floor and the living room still had a niche where a murphy bed was once stored. The kitchen was narrow and painted the dull off-white every apartment seems to be painted and at one end there was space near a window for a small dining table and a couple of chairs, not that we had any of those things. Instead dinner would be eaten off a box while watching the tv we'd placed in the murphy bed niche. At the time I cooked almost exclusively from cans, boxes and packets. I don't think I ever bought anything from the produce section at the grocery store other than bananas for breakfast. Rather we ate lots of boxed macaroni and cheese doctored with jarred salsa and/or canned tuna or pasta tossed with a creamy "pesto" sauce from a packet, courtesy of Knorr. The latter I'd gussy up with a couple spoons full of capers and think I was so very gourmet. In retrospect I'm not sure it was a good idea, but I loved it at the time. Of course I also loved Kraft fat free American singles. I have no idea what ever possessed me to buy capers in the first place. We never had anything with capers growing up and even in college I can't imagine what I ever would have eaten that would have capers in it. I was hardly an adventurous eater. Although it sort of makes sense that I'd like them. As a child I loved sour, vinegary pickles and capers are sort of in the same family. When I came across this recipe in Nancy Silverton's book, Twist of the Wrist, my interest was piqued. Caperberries were something I was not familiar with. I mean I've heard of them but never had I tasted them. I headed to a stylish little gourmet store over on Melrose, near Fairfax and picked up a jar, having struck out at Whole Foods. So for those who don't know, the caperberry is what the little caper will grow into, assuming they aren't picked. They look like small green olives with stems and their flavor is reminiscent of a caper but a little different. First of all the texture has more of a crunch not as soggy, and it sort of tastes like a cross between a caper and a cornichon - subtly briney but with more of a pronounced vinegar taste. Needless to say, after first tasting one, I was smitten. 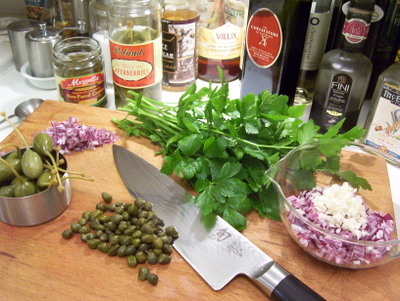 In a small bowl, combine the red onion, garlic, capers, caper berries, parsley, and olive oil. Stir gently to combine. This can be made ahead but not too far ahead. The red onions sort of end up dying everything pink. Next start the fregola. Fill a medium pot with water, cover and bring to a boil over high heat. Once the water comes to a boil, add the fregola (or Israeli couscous) and cook according to the package instructions, making sure to taste about 2 minutes before the package states it should be done. It might not need as much time as the instructions state. Meanwhile move on to the puttanesca sauce. Heat the oil in a skillet over medium-high heat. Add the garlic and cook, stirring constantly, until it has softened but not browned. Add the pepper flakes, stir and cook for another minute or so. 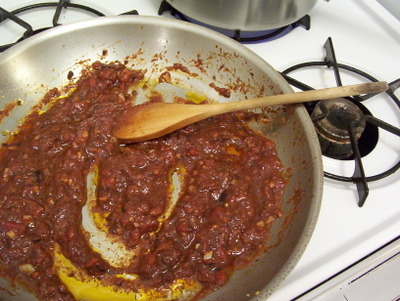 Add the tomato sauce, diced tomatoes, and tapenade. Stir to combine, reduce heat to medium and cook for about 5 minutes, until the sauce has thickened a little. Turn off the heat and add the parsley and taste, adjusting the seasonings if necessary. It will likely need salt. By this point, the fregola should be cooked. Drain in a mesh colander, reserving about 1/2 cup of pasta water, and then toss in with the puttanesca sauce, stirring to coat everything. Add several tablespoons full of the pasta water if the sauce seems too thick. And finally our last component of the meal - the tuna. Season the tuna on both sides with salt and pepper then slather with a little olive oil. Heat a nonstick skillet over high heat for at least 5 minutes. It should be really hot. Swirl in about a tablespoon of olive oil and when it's almost smoking gently lay in your tuna steaks. Cook for 1 minute and then flip over and cook for 1 more minute. The steaks should be still nice and rare inside, practically raw. Immediately remove from pan and set on cutting board while you dish the meal. To serve, spoon a mound of the puttenesca fregola onto a plate. 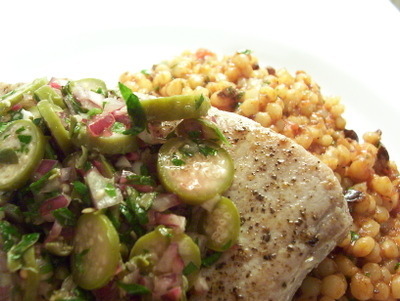 Lay the tuna steak over the fregola and then spoon some of the caperberry relish over the fish. Serve extra relish in a bowl at the table. So I have written about Ms. Silverton's book before, and gone into my issues with it so I will spare you here. However I will say that in the book, the recipe instructs you to just use a jar of store bought puttenesca sauce which then gets doctored with extra garlic, pepper flakes, olive oil and parsley. 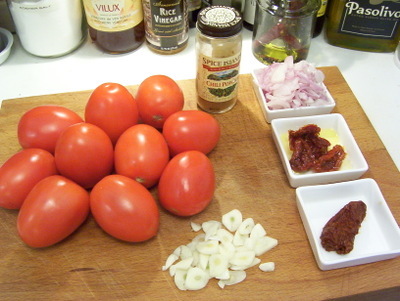 As I was getting my ingredients ready, I realized that puttenesca sauce is really nothing more that tomato sauce + tapenade. Isn't that great? 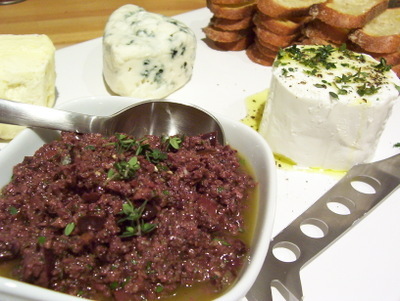 Now I happened to have some homemade tapenade on hand (as I always do), but if you don't you can either buy a jar OR just go ahead and buy the premade puttenesca like Nancy says, but you will have to live with the fact that you cheated. If you make the puttenesca the way I describe, the sauce ends up surprisingly robust, which I think comes from the combination of canned diced tomatoes and tomato sauce. The sauteed garlic, red pepper, and tapenade, flavored with black olives, capers, anchovy adds a richness and depth of flavor. Stirring the sauce into the fregola is a nice, unexpected twist, instead of a regular old boring noodle or some sort of tubey pasta. It's such a fun shape. I feel like it would be great in a simple chicken soup. Tyler Florence recently made a chicken soup where he used chicken sausage and made little meat balls. How cute would it be to combine the chicken meatballs and fregola? I might have to do that. Complimenting and contrasting nicely with the puttenesca, the caperberry relish adds freshness, a vinegary and sharp flavor that cuts through the tomato, and a pleasing, subtle crunchy texture. 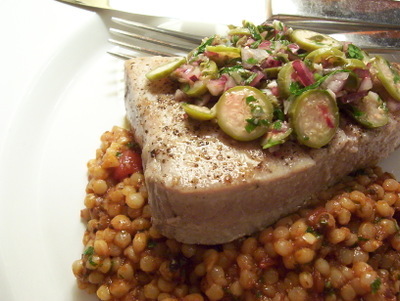 Both the relish and the fregola work well with the tuna in different ways. But let's be honest, the dish is less about the tuna than what the tuna is served with. Not that there's anything wrong with that. With such tasteful sides, the tuna doesn't need anything more than salt, pepper, and olive oil and it's perfect. Whether you sear it as described above, or even grilled it either outdoors on a barbeque or inside with a grill pan, be advised that the dish really is superior if the tuna is cooked to be very rare. I speak from experience. I've made this twice - the first time the tuna ended up over-cooked, while the second time, it was still a deep pink through the center and the difference on the overall meal was astounding. Soooo much better. The fact that it barely takes any time at all makes it a great candidate for weeknight dining, although it's totally fancy enough to serve to guests. As you know this past Thanksgiving, brining turkeys was all the rage. I did not brine a turkey since we always go out to eat, although I have experimented with brining before, pork chops to be more specific. It was a Tyler Florence recipe and I don't recall being very impressed. Recently whilst leafing through one of my Christmas presents, Judy Rodger's obsessive Zuni Cafe Cookbook, I came across a chapter on brining. She explains that this method is their everyday cure they use for pork, insisting that it reliably transforms lean pork into succulent meat. Pork is one of those meats that I find so easy to over cook. As such I tend not to make it very often even though I love it and it's healthy. Looking at the recipe, I was taken with Ms. Rodger's use of the word "reliable." As in "we've done it this way over and over and over again and it WILL work." I decided to give the brine a second chance. 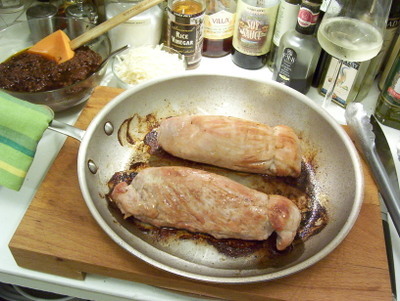 The decision to serve my brined pork loins with romesco sauce was inspired by one of the recipes on Sunday Suppers at Lucques, one in which Suzanne Goin uses it as an accompaniment to some thick pork chops (which she too brines). 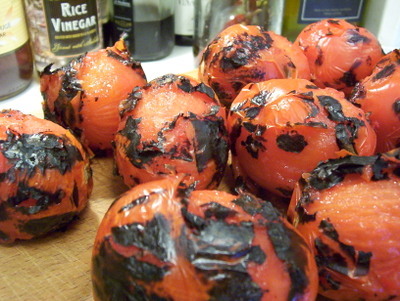 I've always wanted to attempt romesco, after reading about it's versatility over at Immaeatchu. Like seriously, Susan has found a way to work it into so many different dishes, and each one looks better than the next. For those who don't know, "romesco" is a sauce that originates in Spain, Catalonia to be exact. Like so many of these sort of sauces, recipes often vary, but the common ingredients are reconstituted dried peppers, almonds, hazelnuts, garlic, and lots of flavorful olive oil, all pureed into a thick sauce the deep color of red clay. Many recipes also include roasted tomatoes, red wine vinegar, paprika, cayenne pepper or red pepper flakes and some chewy bread that has been fried to a golden brown. 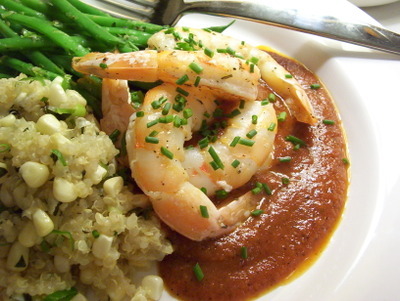 Usually the sauce is spooned over seafood like shrimp and fish or with meats like chicken, beef, pork etc., although really, it seems like it would be good on pretty much anything. There are a number of steps and components to the sauce (toasting the nuts, frying the bread, etc) but it's totally manageable. In fact, you can easily make it days before you intend to serve it and by doing so, the flavors will the the opportunity to meld and deepen. To go with the sort of Spanish flavors, I decided to serve the pork and romesco along with a big pot of risotto flavored with saffron. 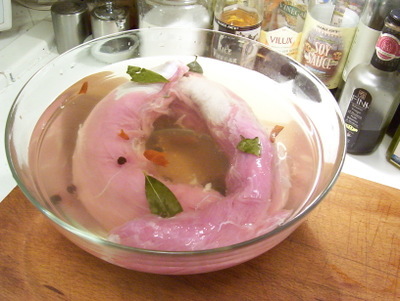 First, brine the pork, since it takes the longest - 2 to 4 days in the brining solution. Combine 1 cup of water, the juniper berries, bay leaves, and chiles de arbol. Bring to a simmer then turn off the heat and let sit for about 10 minutes, to infuse. In a large bowl, combine the infused water along with the juniper berries, bay leaves and chiles de arbol, 4 more cups cold water, the salt and sugar. Stir to dissolve the sugar and salt. Rinse the tenderloins and then place in the brine. Use a small place to keep the pork completely submerged. Cover and place in the refrigerator for 2 to 4 days. Next make the romesco. Preheat the oven to 350 degrees F.
Bring two cups of water to a simmer in a small pan. Turn off the heat and add the peppers to the water and let them soak for 15 minutes, to soften. Meanwhile, place the almonds and hazelnuts on a small, rimmed baking sheet, in separate piles and then roast in the oven until the skins of the hazelnuts darken, about 10 to 15 minutes. 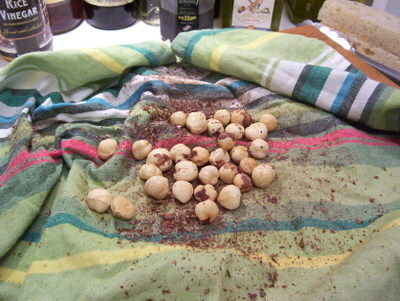 While they are still hot, bundle the hazelnuts in a kitchen towel, gather up the edges and then scrunch and massage them to rub most of the skins off. Pick out the nuts and set aside. Pour 1/4 cup of olive oil in a skillet and heat over medium heat. Add the 3 cloves of garlic and fry until soft and golden. Remove the garlic from the pan and set aside. 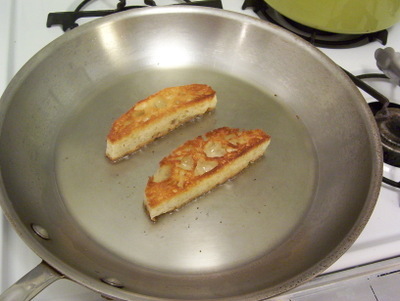 Add the bread to the pan and fry until golden brown. Remove from the pan place on a paper towel to cool and drain, leaving the oil in the pan. When it's cool enough to handle, tear the bread into chunks the size of croutons and reserve. Remove the peppers from the water and place on a paper towel and pat dry. Heat the oil left in the pan again, over medium-high heat. Add the chiles to the oil and saute for a minute or two. Be careful when adding the chiles, it may sputter and pop. 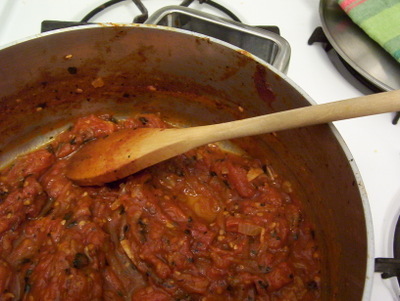 Add the canned tomatoes and season with 1/2 teaspoon of salt and cook for 2 to 3 minutes, stirring often, until any tomato juices have cooked off and the tomato has gotten a little color. Turn off the heat and let cool slightly in the pan. Place the hazelnuts, almonds, garlic, and fried bread in a food processor and pulse until coarsely ground. Add the chile and tomato mixture and process until combined. 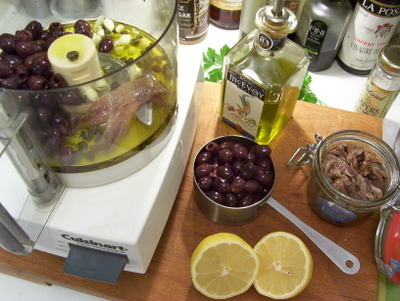 With the machine running, slowly pour in the 1 cup of olive oil until the mixture has formed a smooth puree. Don't worry if it seems like the olive oil and the solids sort of separate. This is normal. Scrape the romesco into a bowl and add the parsley, paprika, cayenne and a spritz of lemon juice. Taste and add more salt if it seems like it needs it. This can all be done ahead of time. Just place in a airtight container and put in the refrigerator until you plan to serve your meal. Just be sure to remove from the refrigerator at least 1/2 hour before, so it can come back to room temperature. You see, the olive oil sort of solidifies in the refrigerator. And back to the pork. Preheat oven to 425 degrees F. Remove the pork from the brine and pat very dry with a couple layers of paper towel. Drizzle with with a little olive oil and rub into the pork. You DON'T need to season with any salt or pepper, thanks to the brining. Heat an ovenproof skillet over high heat for two minutes. 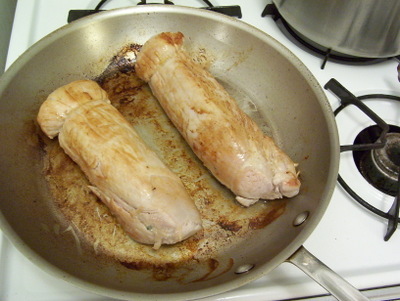 Add a tablespoon of olive oil and place the tenderloins in the pan and sear on all sides, until golden brown. I'd like to have gotten a little more color on mine. Place the skillet in the oven and roast the meat for 22 to 25 minutes. Remove from oven and let rest for about 10 minutes. While the meat is roasting, it's a good time to make the risotto. Heat the broth and saffron in a medium saucepan, cover and bring to a gentle simmer. In another heavy-bottomed pot, heat butter and olive oil over medium-high heat. Add the onion and sauté until translucent. Add rice and stir thoroughly to coat with butter. Add the wine and stir with a wooden spoon to combine. 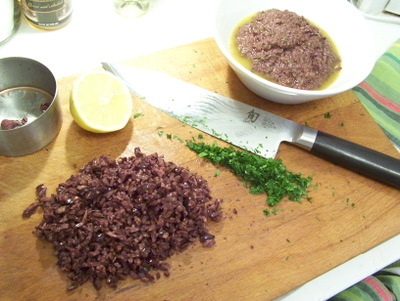 Continue stirring until the wine has been absorbed by the rice. Add a ladle full of hot broth and stir continuously until almost all the broth has been absorbed. It'll go from being quite soupy to dry but creamy. Repeat the process of ladling in stock and stirring until combined. Taste after 20 minutes. The rice should be tender, but still firm and intact. If not, continue adding stock, but be sure to keep tasting. You may not need to use all the broth. If you just continue adding the stock until it's all gone, the risotto could end up mushy. (I had about 1 cup of stock left over) Stir in the Parmagiano Reggiano, drizzle with olive oil and season with salt and pepper to taste. Okay so I think I might be a brining convert. I have to admit, it works quite well. It not so much makes the pork really juicy so much as it makes it incredibly tender. As in you can cut it with a fork. That tender. It's kind of amazing. The aromatics, sugar and salt, give it a really interesting, sort of unexpected flavor that permeates every cell of the meat. I next want to try brining some nice thick chops again and experiment with a different combination of flavors. And then on to brining poultry. The romesco pairs really well with the pork. The flavors are bold and earthy with a slow moving, vaguely bitter heat that kicks in after you've swallowed. The texture is thick and grainy but with a velvety slickness from the olive oil. I really recommend giving it a try. It brings to mind one of those sauces like charmoula, salsa verde, and chimichurri, versatile, capable of dressing up anything it's associated with, be it simple grilled chicken, roasted meats, fish and other seafoods or even slathered on a sandwich or used as a dipping sauce. 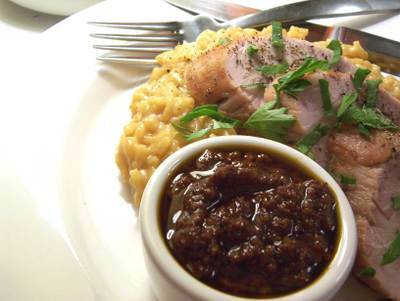 The risotto goes wonderfully with the pork and romesco, contrasting the textures and flavors. The saffron tints the rice a beautiful pale golden color and gives it an unexpected sort of subtly floral flavor. It's consistency is creamy and rich, thanks to the Parmagiano Reggiano. I can imagine the risotto would be great formed into little balls stuffed with a tiny cube of Manchego, then dredged in egg, coated in Panko and then fried crisp. A nice little Spanish take on the classic Italian Arancini. Hmmmm, I might have to give that a try. Just so you know, this past Sunday, Well Fed turned two years old. I meant to do a special birthday post featuring a new version of a recipe I did on my previous blog that was sort of the inspiration for the formatting for this one, but I ran out of time. I'll probably do it this weekend. Look for it early next week. And speaking of birthdays, this past Saturday I hosted a belated celebration for my friend Lauren. A couple weeks ago she had a gathering at a really cool wine bar near her place in Santa Monica, but I was unable to attend. Neither could our friends Heather and Jessica, who you might know as the Fug Girls. They were out of the country on a special fug mission. Upon their return I decided to have them all over for a low key dinner thing to celebrate Lauren's special day. Better late than never, right? As I've mentioned before, since my place is so small and there is no dining table, I usually try to serve dishes that can be eaten with a fork only, no cutting with a knife, since my guests will be either balancing their plates in their laps or holding them with one hand while eating the other. I want whatever they eat to be easy. As such I usually serve tender meats or fish. One of my goals this winter was to do some more braising and this seemed like a good occasion to do so. I had planned on doing another one of Ms. Goin's recipes, a slow-cooked pork stew with roasted root vegetables, but it seemed a little complicated, a few too many steps that needed to be done at the last minute. I have every intention of eventually giving it a try. I thought back to an issue of Bon Appetite from October that featured this recipe on the cover. Beef short ribs were an ingredient I've not ever worked with but have wanted to and I had just happened to have read a chapter devoted them in Bill Burford's captivating book Heat, an account of the author's time spent working under Mario Batali at his restaurant Babbo. Over the last several years short ribs have been showing up on lots of menus at many of the more trendy restaurants, and with good reason. First of all, they are relatively cheap. Meats that are braised usually are. They tend to be cuts that are usually tough and require long slow cooking. However, these cuts also have lots of flavor, thanks to the ribbons of fat that runs through them. Remember that people. Fat = Flavor. Short ribs come in two different styles, English cut and Flanken cut. English are nice little rectangles, about 2 inches by 3 inches by about 1 1/2 inches thick, with a wide, flat bone running through them, longways. Flanken cut are longer with two bones running through, shortways. 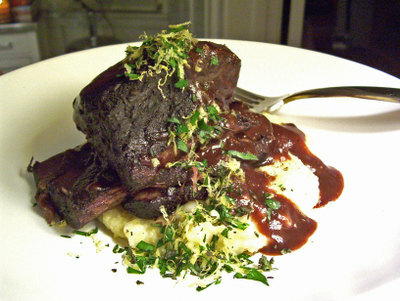 One of the nice things about them is that one short rib is pretty much a perfect serving, sort of like a shank. Which might be why the chefs at Bon Appetite thought it appropriate to serve them with gremolata. Made of parsley, garlic and lemon zest, gremotala is a traditional accompaniment to the Italian braised veal shank dish known as Osso Buco. This version also has thyme and rosemary. Two of my favorites herbs. Wine, meat, garlic and fresh herbs, all served atop a creamy mound of Gorgonzola streaked polenta. How could this not be great? 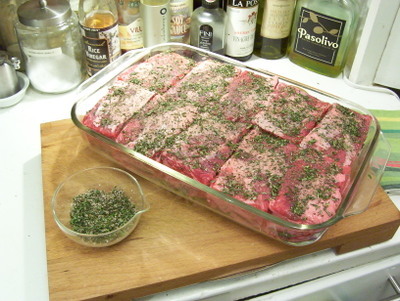 Arrange ribs in single layer in 15x10x2- inch glass baking dish. Mix rosemary, thyme, salt, and pepper in small bowl; sprinkle all over ribs. Cover and refrigerate overnight. Let stand at room temperature 1 hour before continuing. Preheat oven to 375°F. Heat 2 tablespoons oil in heavy wide oven-proof pot over medium-high heat. Working in batches, add ribs to pot and sear on all four sides (don't worry about the ends), about 3 or 4 minutes per side. Don't rush this process. The darker the meat, the more richness and flavor the finished result will have. 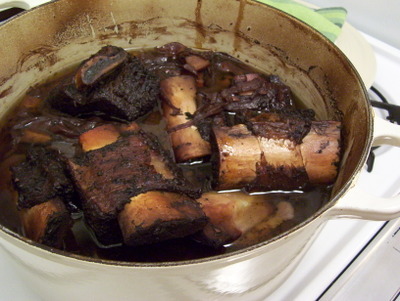 As you brown, you may have to add more oil to the pot if needed, although the short ribs will give off some fat. After all the ribs have been browned, pour off and discard the remaining oil and drippings. Add the sliced onion to the pot and and add a little salt, cooking until translucent, about 5 minutes or so. The salt will extract the juices in the onions which will help you deglaze the pan, using a spoon to scrap up any of the the crispy bits and color left in the bottom from the browning of the meat. Add the garlic, carrots and celery, stir to combine and cook for an additional 2 minutes. 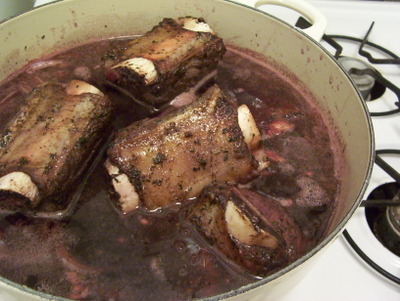 Add wine and return ribs and any accumulated juices to pot and bring to boil. (To properly braise, the liquid should not quite cover the meat. I probably used too many short ribs for a pot this size, since some of them where completely submerged. Oh well.) Cover and then transfer to the oven and braise until meat is very tender and almost falling off bones, about 2 hours. These next few steps might sound sort of fussy and overly complicated, but they really aren't. 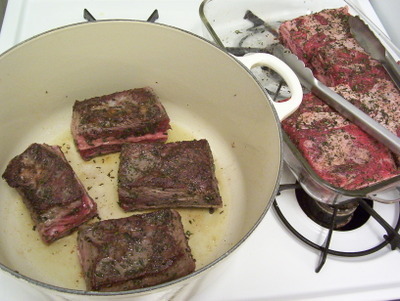 Remove the short ribs, place in a baking dish and once they've cooled, cover with plastic wrap and refrigerate. Pour the braising liquid through a strainer, pressing gently on the solids. The braising liquid will likely be very greasy. 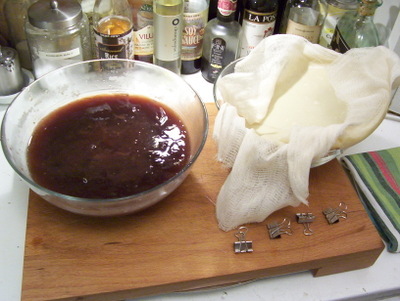 A great way to skim the grease off is to cover the bowl of strained braising liquid with two layers of cheese cloth, criss-crossing one another. To keep it from sinking into the liquid I use mini bull clips to keep the cheese cloth in place. Place the bowl full of braising liquid in the refrigerator over night. 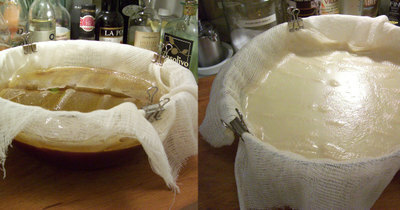 The next day, the fat will have solidified into the cheese cloth. Simply remove the bull clips and lift off the cheese cloth. All the solidified fat will come right with it leaving behind perfectly de-greased braising liquid. I much prefer this method to using a spoon. It's kind of like magic. It could also be used for de-greasing homemade stock. Isn't this a great trick to know? Remove the ribs from the refrigerator and let sit for one hour, so they can come to room temperature. Preheat the oven to 350 degrees F. Remove the plastic wrap from the baking dish, spoon a little of the braising liquid over each short rib and then reheat in the oven for about 30 to 45 minutes until the meat is heated through. Meanwhile, pour the rest of the braising liquid into a pot and bring to a boil, reducing it to approximately 2 generous cups, which should take about 20 minutes. Combine 2 tablespoons butter, 2 tablespoons flour, and 2 tablespoons of the hot liquid in small bowl and mix with a spoon until well blended. Whisk butter mixture into reduced braising liquid. 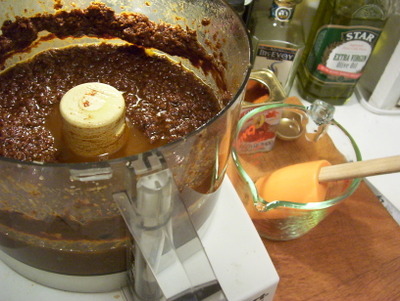 Continue whisking over medium-high heat until sauce thickens very slightly, about 2 minutes. 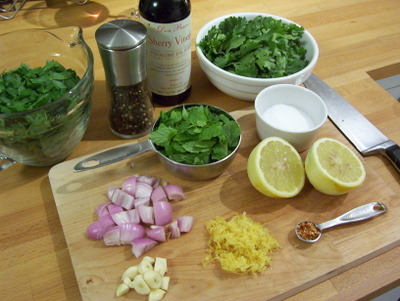 To make the gremolata, mix all ingredients in small bowl. This can be made 1 day ahead. Store in an airtight container in the refrigerator. When it's getting within about twenty minutes of when you want to serve the ribs, make the polenta. Bring 4 cups chicken broth and one cup of water to a boil in heavy 4-quart saucepan. Gradually add polenta, whisking constantly. Return mixture to boil. Reduce heat to low, cover, and simmer until polenta is tender, stirring frequently, about 10 minutes. If the polenta becomes too think, add a little more water or chicken broth. Remove from heat. Add Gorgonzola and cream; stir until cheese is melted. Season to taste with salt and pepper. Divide Gorgonzola Polenta among plates. Top with one of the ribs and a couple spoonfuls of sauce. 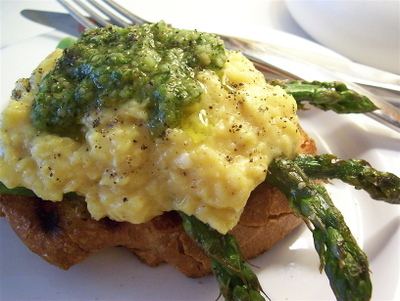 Sprinkle with Mixed-Herb Gremolata and serve. Even though there seem to be a lot of steps, it's all totally manageable. With the exception of the seasoning the meat and letting it sit overnight, all of this could be done in one day, but it's so much easier if you spread it out making it great for entertaining. A majority of it can be done ahead of time and then when your guests have arrived, it's totally laid back. As was the case when my guests were present. There were lots of offers to help in the kitchen but I assured them that everything was covered. It's so satisfying. Equally satisfying are the results of all the work. The meat, having been braised for hours winds up perfectly tender, falling off the bone, not at all mushy. Then reheating them in the baking dish it with just a little of the braising liquid spooned over sort of caramelizes the outside a little and gives it a really pleasing crust of sorts that contrasts nicely with the soft center. 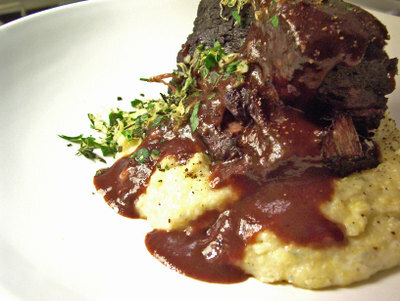 The Cabernet sauce is thick and rich, sort of glazing the meat and then pooling in and around the creamy polenta. The blue cheese melts leaving little pockets of pungent saltiness. 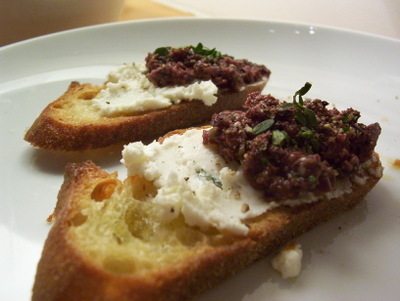 Blue cheese, of course, is fantastic with red meat and this is an unexpected way to do it. Since so much of the dish it quite rich, the gremolata gives a nice juxtaposition - bright, fresh and light. Be sure to make more than you think you'd need. You will want leftovers. Govind Armstrong, chef of Table 8, makes a fancy grilled cheese sandwich with some braised short ribs. You could use it in a hash topped with poached egg. I've seen a number of recipes that turn it into a hearty ragu to be served over pappardelle or gnocchi. You might be seeing the short ribs make another appearance. I meant to post on Monday or Tuesday. 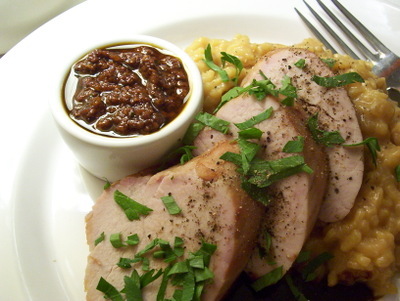 I'd had Annie and Pierson over for a little casual dinner party and had made a roasted pork loin coasted with a paste made from shallots, garlic, crushed coridander seeds, pepper and fresh sage, which I served with an apple chutney. However, come Monday I was stricken with an unpleasant stomach virus. I will spare you the details, but suffice it to say, my appetite was compromised. This is a new thing for me. I always have an appetite. I always think about food, what I'm going to have for lunch, what I'll make for dinner, plotting what to make over the weekend. This virus was not exactly crippling, I was able to go to work, but food was no longer on my mind. I couldn't look at it, smell it, anything. After several days of choking down chicken soup and queasily slurping fruit smoothies, my appetite has finally returned to me. Welcome back, old friend! As much as I sort of want to jump back into the world of food and flavor, I suppose I ought to take baby steps. As such, apple sauce seemed like a good idea. 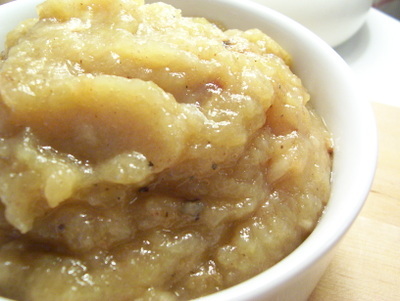 Sick people and babies love apple sauce. This recipe was sort of inspired by a Martha Stewart recipe, but I also combined it with a few others. I loved the idea of roasting the apples, rather than stewing them on the stove and the addition of cardamom gives the sauce a subtle, but unexpected and unique flavor. For those who are unfamiliar with cardamom, it's a spice that is part of the ginger family and is typically used in Indian and Scandinavian cooking. 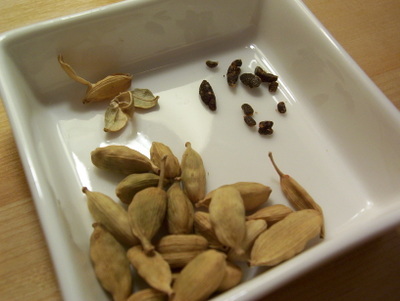 Cardamom seeds are usually sold still in their pods, as the flavor quickly diminished once they are removed. The flavor is sweet, floral and spicy, similar other "warm" spices such as nutmeg, cinnamon, cloves and mace. To get at the small black seeds, crack open the pods with the side of a knife. The seeds can then be ground in a mortar and pestle or simply finely chopped with a sharp knife. In a 9 by 13 inch baking dish, add the apple cider, brown sugar, lemon juice, cinnamon, cardamom, nutmeg and salt, and then whisk to combine. 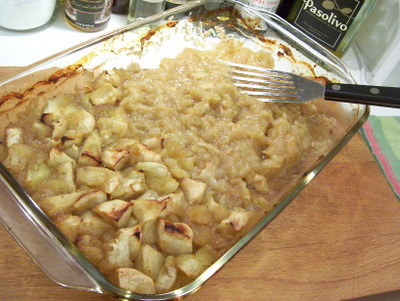 Add the apples and toss to coat then place the dish in the oven. Roast for 30 to 40 minutes, until the apples are very soft. Remove from the oven and let cool for about 10 minutes, then using a fork, mashed potato masher, whatever you have (I used a fish spatula) mash the apples to form a chunky sauce. 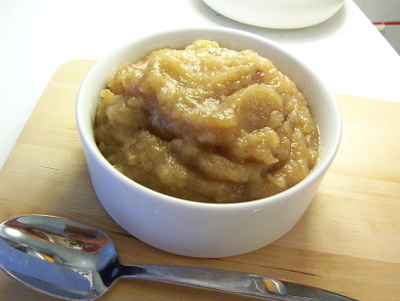 If you've never made home made apple sauce, seriously people do it. This recipe in particular is sooo easy. The only thing that takes any time or effort is peeling the apples and if you have a food mill or a potato ricer, you don't even have to do that, the resulting apple sauce however, will be more rosey in color. I prefer to peel them so then when I mash them after they've cooked, the texture will stay sort of chunky and more rustic. The combination of McIntosh and Granny Smith apples gives a good balance of sweet to tart and the lemon juice brightens the flavors. The apples really don't need much sugar, but the brown sugar adds a caramel richness that is further enhanced by the fact that apples get caramelized from the roasting. The cinnamon, nutmeg and our new friend cardamom give the soft, sweet apples a warm, sort of aromatic heat. Comparing recipes, some call for vanilla, either extract or freshly scraped seeds from the pod, as well as a little butter tossed in prior to roasting. You could do that, but it sort of took the apple sauce in a slightly different direction from what I wanted. 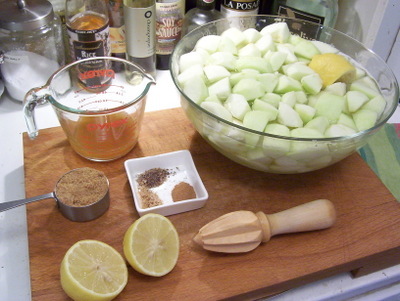 Another option is to replace the apple cider with Calvados (which is an French apple brandy) or just regular brandy. I should think that would give the dish an elegance that would work well if it was part of a nice, sit down dinner. Hey, that might be a good idea for Thanksgiving. But since I'm still recovering, I opted to leave it out. 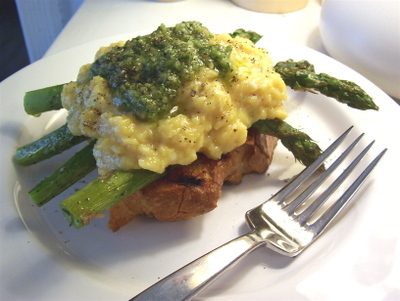 Next time I make this, I might give it a try. Apparently the apple sauce can be frozen for several months, but I can't imagine that there will be any left to freeze. I'm just going to say it. I'm not pleased that Hung won. His arrogance always felt to me like a hollow, premeditated strategy, rather than a true reflection of who he is. Throughout the season I've found his food to be lacking in any sort of personal style and not very inspired. In fact, some of it was oddly dated. I will never get past those cucumber rounds topped with salmon mousse that he served on the cocktail party on the boat. Annie's disappointment was a little more emphatic than my own. "I'm finished with this show!" she screamed at the television as Padma announced the winner. "That's it! I'M DONE!" The evening ended on an embittered note, although it was sort of in keeping with what had been up until that point a somewhat tedious evening filled with a succession of mishaps. First, on his way to Annie and Pierson's new house, Mark got lost and wound up at the airport. While I was grilling the steaks, the gas tank on their barbeque ran out (fortunately they had a spare). Then while Annie was running the garbage disposal she came to the sinking realization that the end of a pipe had accidentally been blown off and garbage disposal water was shooting out into the driveway. As we watched the show, Pierson crawled around under the house trying to figure out what the problem was, cursing the fact that they no longer had a landlord. At least the food was good. The meal consisted of grilled skirt steak with chimichurri sauce, horseraddish mashed potatoes, green beans sauteed with garlic, lemon juice and zest and then tossed with chopped parsley. Dessert consisted of vanilla sugar roasted peaches with vanilla ice cream and crushed ginger snaps. For those who don't know, chimichurri is sort of like Argentina's answer to Morocco's charmoula or Italy, Spain, and Mexico's versions of salsa verde which is to say, a sauce made primarily of finely chopped or pureed herbs and olive oil. Traditionally chimichurri is served with grilled meats and includes parsley, oregano, paprika, garlic and red pepper flakes. I like this version, which comes from the July 2006 issue of Bon Appetit, because it also incorporates cilantro and mint. Place the skirt steak in a shallow casserole dish and season on both sides with the salt, pepper, minced garlic, oregano and chiles de arbol. 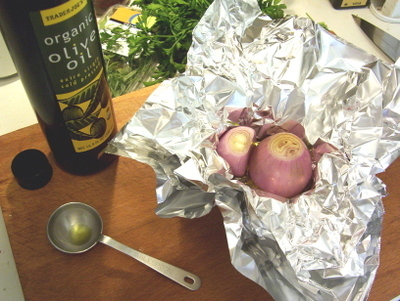 Drizzle with the olive oil, cover the dish with cling film and refrigerate for at least two hours. Next make the chimichurri sauce. Combine first the olive oil, vinegar, lemon juice and zest, garlic, shallots, salt, pepper, and red pepper falkes in blender; blend until almost smooth. 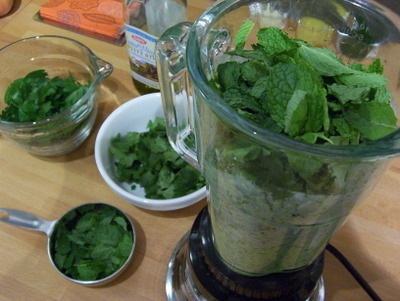 Add 1/2 of the parsley, 1/2 of the cilantro, and 1/2 of the mint; blend until incorporated. Pour the mixture into a medium bowl and set aside. 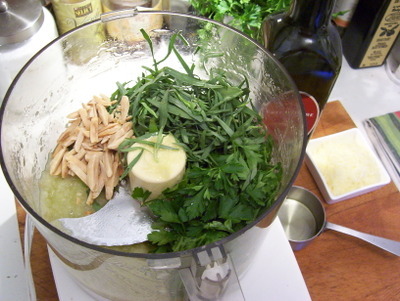 Meanwhile, very finely chop the remaining parsley, cilantro and mint and then add it to the pureed mixture. Stir to combine. 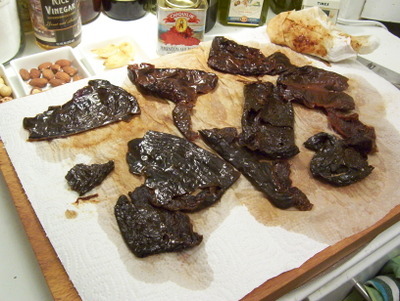 30 minutes or so before grilling, remove the skirt steak from the refrigerator and let come to room temperature. Pour a little olive oil onto a paper towel that has been folded over into a thick, small small square and wipe the ridges of a grill pan and then place the pan over high heat for 5 minutes. Place the skirt steak in the grill pan and cook for about two minutes on the first side. With a pair of tongs, flip the skirt steak and grill for another minute or two, for medium. Place the cooked skirt steak on a cutting board and let rest for ten minutes before slicing. Meanwhile, continue cooking the rest of the steak. Cut the steak against the grain, at an angle into very thin slices. Serve with the chimichurri sauce. 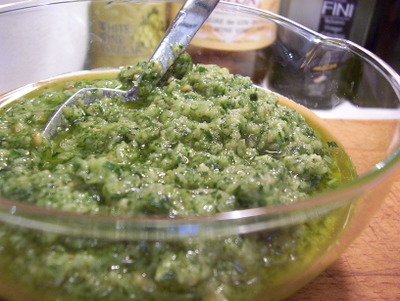 Often when I've had it in restaurants, chimichurri is tends to be a greasy slick of olive oil in which chopped parsley and other herbs are suspended. Not that there is anything wrong with a bowl of chopped herbs floating around in olive oil. 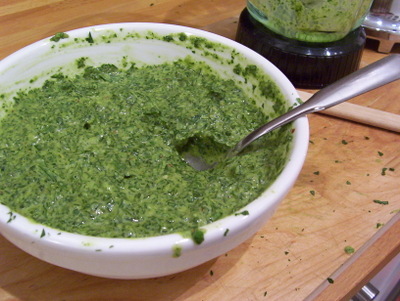 However this verdant chimichurri has a thick, almost creamy consistency (thanks to the emulsification power of the blender) it's richness balanced out by a herbaceous and tangy flavor. The sauce is bright but with a spicy piquancy from the crushed red pepper and a pungent bite from the garlic. It's great for anyone who is under the impression that they don't like cilantro, as the mint tames what many people consider to be the soapy flavor. 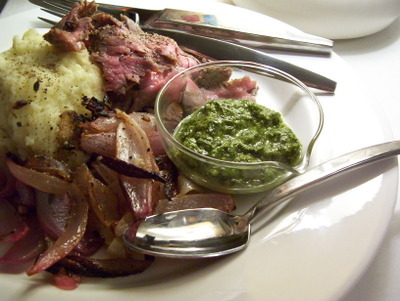 Since I had some sauce left over, I served it again a few nights later, with more grilled skirt steak, more horseradish mashed potatoes, and big pile of sticky, sweet roasted red onions. As perfect as the sauce is spooned onto thin slices of grilled skirt steak, it would be equally fabulous with chicken, pork, fish and other seafood. I can imagine the sauce mixed with several heaping spoonfuls of mayonnaise and then slathered onto a sandwich. In fact I can imagine it on pretty much anything with the exception of cereal. A couple weekends ago, Annie and Pierson had a big afternoon housewarming shindig at their lovely new home down in the city of Culver. Parents flew in from Pennsylvania and down from Oakland. Friends gathered, co-workers dropped by. It was a lovely affair. The new home owners rented a couple bar height round tables which were topped with crisp white table clothes and casual little flower arrangements popping out of pretty little goblets. A blanket had been splayed on the lawn in the shadow of the avocado tree, and a bar set up beside the garage. And then there was the food. Annie and I were at it again. Peaches wrapped with basil and Serrano ham. Mini corn cakes topped with smoky tomato couli, a dollop of creme fraiche, and a scattering of minced chives. A spinach salad with a citrus vinaigrette and shards of Parmesan frico crisps. Crostini spread with tapenade, and topped with an arugula leaf, paper thin slices of rare pepper crusted beef tenderloin, and horseradish cream. Lest I forget the signature cocktail, which was a ginger-peach prosecco bellini. There were a few issues with the dessert that I won't go into. I don't want to embarrass the person who's task it was to bake them. During the kitchen was a flurry of activity. Annie's father grilled the eggplant. Annie rolled out and topped the pizzette. Heather assembled the crostini. Annie's mother was in charge of the peaches as well as being our sous chef. And I was managed the corn cakes. The "however" refers to the fact that as happy as we were with the dishes and as much as I'd love to share them, it was far too chaotic to get pictures. For that I apologize. You see, typically when I cook at home, poor Mark has to sit and wait, knife and fork in hand stomach growling as I methodically plate the finished meal, set it up by my light source, and take picture after picture, turning the plate ever so slightly, changing angles, trying to get the perfect shot. For a party, that just wasn't realistic. But don't worry, like some of the dishes from Heather's birthday that Annie and I catered, I plan to revisit and recreate many of the recipes. First up is this smoky tomato coulis, which as I mentioned, topped the mini corn cakes. For those who don't know, a coulis is a thick sauce made of either a vegetable though more commonly a fruit puree that has been strained so that it is perfectly smooth. For example, a strawberry or blackberry coulis, that you might serve with cake or ice cream at the end of a dinner party. This recipe comes from the Martha Stewart Living Cookbook. It is not, however, on her website. Anyway, after the party I ended up with about a cup of coulis left over. Although it was great on the corn cakes I decided it might be interesting to sort of repurpose it. Definitely try it on mini versions of these corn fritters as an appetizer, or use it in a meal, as I've done here. 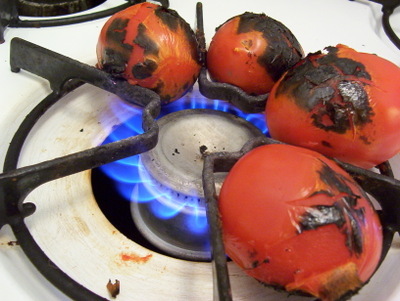 Roast the tomatoes over a gas flame or on a grill until the skins are charred and blackened, which takes almost no time at all. When the tomatoes are cool enough to handle, quarter them and place in a saucepan, along with the garlic, shallots, and sun-dried tomatoes. Cover and cook over medium heat for 30 to 40 minutes, stirring occasionally. Add the chipotle pepped and the chile powder and then cover and cook for another 30 to 40 minutes. Depending on the kind of tomato you use (romas have more flesh and less of the juice than other tomatoes), the sauce might seem a little thick. If it is, add 2 to 4 tablespoons of water. 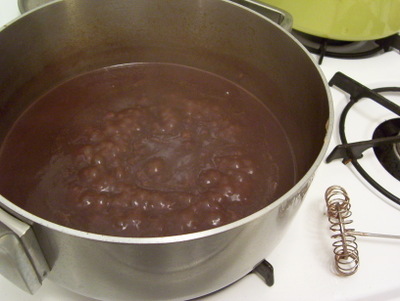 When the mixture is finished cooking, strain it through a sieve, set over a bowl, pressing down on the solids. Make sure to scrap the underside of the sieve. The resulting sauce should be about the consistency of ketchup. Season with salt. The couli can be made several days in advance, stored in the refrigerator in an airtight container. It can also be frozen for up to 3 months. To make the shrimp, preheat the oven to 400 degrees F. Place the shrimp on a sheet pan and sprinkle with the salt and pepper. Drizzle with the olive oil and juice, and roast in the oven for 5 to 6 minutes. 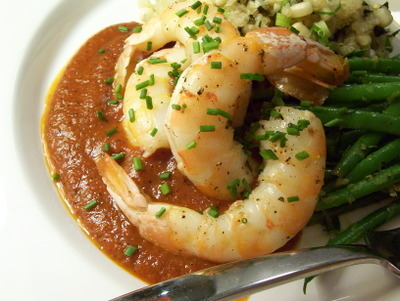 To serve, spoon some of the coulis onto a plate and then mound several shrimp on top, then scatter with chopped chives. 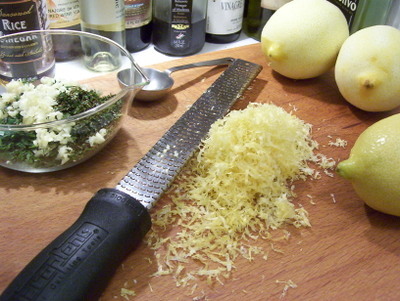 A chiffonade of basil would also be appropriate. Or some tarragon. Or dill (duh). Roasting is a really simple, basic way to prepare shrimp. It takes such little time, and best of all, it's completely hands off. I like that you don't have to flip each shrimp, one by one. It's great if you've got several other dishes going on that do require attention. This method would be a great way to make shrimp to add to a salad, toss with pasta, or for use in a shrimp cocktail, where it would be a great variation on the usual poached shrimp. Speaking of which, the tomato couli is very reminiscent of cocktail sauce, but without the horseradish of course. It's tangy and fresh, but with a smoky undercurrent and two levels of subtle heat, that hit different parts of the tongue at different times. It's really nice. The sauce is great with the shrimp, although I can also see it accompanying some grilled fish, chicken or swirled into soup. It would be fantastic on a burger as a kind of home made ketchup. It would also be very elegant served alongside some steak frites. You could also use the couli as a pasta sauce, however if that were the case, I might not bother pressing it through the sieve.